History of the Boston Bear: How the Bruins came to "B"
As many hockey fans, and Bruins fans in particular know, the Boston Bruins are the NHL’s oldest American team. Over the last 91 years, the Bruins have gained a massive gathering, and have become one of the NHL’s most beloved teams. In the rich sports region of New England, the Bruins are adored. For hockey fans across the region, winter (and parts of fall and spring) is the best time to be alive. And yet, despite their passionate following, many Bruins fans don’t know how the team, as well as the nickname, came to be. It’s a shame, because it’s one heck of a story. So, for those of you who don’t know the tale of the “B”, let us enlighten you. 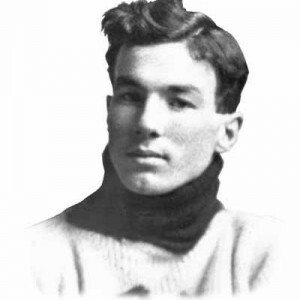 Defenseman Eddie Shore, sporting the Bruins colors in 1926. In 1924, Charles F. Adams, the president of the America’s first supermarket chain (Finast), returned home to the Boston area from a trip north across the border, to see the Stanley Cup finals match-up between the Canadiens and Calgary. A Vermont native, Adams had already owned one Boston sports team – the Boston Braves of the MLB. As a hockey fan, Adams understood that the region could use a hockey team, and was ready to make the move to bring the United States its first professional hockey team. As a successful businessman, he also had the cash. Adams bought the franchise rights from a man by the name of Thomas Dugan in February of 1924. The asking price? $15,000. By November, Adams had himself a team. Ironically enough, the team’s name was not the first check on the agenda. Instead, Adams quickly decided on the team’s colors. Adams’ supermarket chain had a brown and yellow color scheme, and when he purchased a hockey team, he was absolutely going to keep his colors with him. Brown and yellow it was. Who doesn’t like a little extra advertising, right? However, what type of nickname could a brown and yellow team have? The new owner took to thinking, with the help of some guy you probably have never heard of named Art Ross, who Adams had hired as the team’s general manager. The old English term “Bruin” (meaning bear), which originated the medieval children’s tale, “History of the Reynard Fox” seemed to roll off of the tongue quite nicely, and matched the color scheme that Adams was looking for. On top of that, the Bruin represented all of the characteristics that Adams wanted in his hockey team – speed, strength, etc. The name has held ever since, despite the fact that the team’s colors (its original characteristic), has evolved into the black, white, and gold “spoked B” that we love and cherish today. So the next time an uncultured hockey fan asks what a Bruin really is, be sure to tell them the tale of Charles Adams, his grocery store, and his love for the greatest game on the planet. This article was originally written in October, 2015.